Google launched the Android L at the Google I/O 2014 alongside the “Android One Project“. The Android L is a major overhaul from Android ICS, Jelly Bean and KitKat. Many things have changed with the “Material” design Google is trying to beautify the entire user experience. New card style multitasking, New notification bar etc have changed. Along with new icons the settings panel is also been changed. 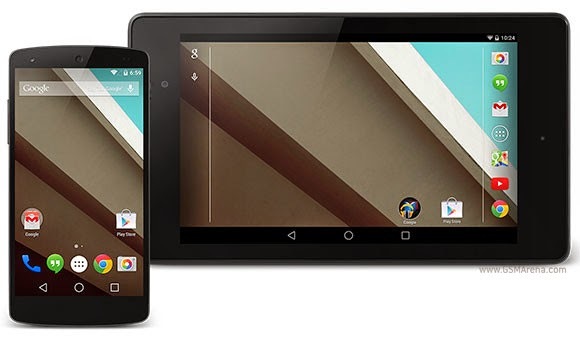 Google released the Developer preview of Android L for the Nexus 5 and Nexus 7 2013 WI-FI only model and it is now ready to be flashed on your device. NOTE: Before proceeding take a backup of your contacts, sms, apps another important data. Otherwise everything will be lost. This is a Developer preview and will have Bugs so it is recommended only for developers and not for daily users. 1. Download the factory image of your device, Fastboot/ADB files, Drives and extract all their contents inside a new folder called “Nexus”. And install the drivers. 2. Open up a new Terminal or Command Prompt window and use the ‘cd’ command to navigate to the “Nexus” folder created in previous step on your desktop. 4. Make sure that your Nexus device is being detected by the PC when connected via USB. For PC type the following in command promt. This will check whether your nexus device is properly connected or not. If not, then install the drivers once again and make sure that they are placed in the same folder. 5. Now unlock the bootloader of your Nexus device by executing the below command. Make sure to confirm the selection on your Nexus 5 or 7 by pressing the Volume up button. 7. Your nexus device will reboot now. The first boot after flashing the factory image of Android L will take more time then a normal boot so keep patience and don’t be panic. And there you have it your Nexus 5 or Nexus 7 is now running the latest Android L Developer preview. Enjoy!